As a fourth hospital in England closes its casualty ward overnight, and with more downgrades likely to follow, are the alternatives for patients sufficient? Medical director Dr Peter Collins admits it was a difficult decision, but Weston General Hospital, which serves more than 200,000 people in North Somerset, will close its doors at night. More hospitals are likely to follow. The British Medical Association estimates that in 18 areas, health bosses are considering closing or downgrading their A&E departments. 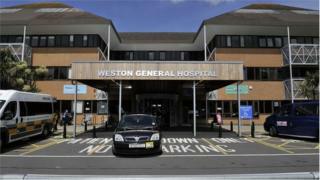 Analysis of hospital data at Weston shows one in five patients attended between the hours it is now closed. Those with serious and life-threatening emergencies are being told to dial 999 and ambulances will take them to hospitals in Bristol, 24 miles away, or Taunton, 27 miles away. The NHS insists closures will only happen when there are viable alternatives in place such as longer GP opening hours, or better centralised care elsewhere. For more stories from the BBC England data unit visit our Pinterest board. Which hospital A&Es are closed overnight? Four hospitals in England are currently closed overnight for safety reasons due to shortages of staff. Do people make unnecessary A&E visits? Possibly. Just over one in 10 people who go to A&E get discharged without needing treatment. Another third are given "guidance or advice" only, according to NHS Digital. However, in a report in March 2017, health charity The King's Fund said: "This does not mean that all these people are attending A&E unnecessarily or could be cared for elsewhere." It blames a lack of access to GP appointments, access to out of hours care and confusion about where to go. The first port of call when something is not life threatening should be a GP. Out of hours, usually after 18:30 and before 08:00, people can call their surgery and listen to the answerphone message for details of what to do. Often, people will be directed to the non-emergency number, 111, for advice and details of walk-in centres or other services. About a fifth of people who call are either told to go to A&E or have an ambulance dispatched. However, surveys of NHS 111 users suggest about 45% of people would have gone to A&E or called an ambulance if they had not called for advice first. The majority get directed to primary or community care, such as a walk-in clinic. Accident and emergency departments in some hospitals have been replaced with minor injuries units and urgent care centres, usually led by nurses. However, analysis of 138 minor injuries units and 83 urgent care centres found many open 12 hours a day or less with one in seven minor injuries units closed at weekends. The NHS does not make a clear distinction between the two types of centre and what they offer. It warns some cannot treat young children and urges patients to check what is offered "in advance". Tim Gardner, senior policy fellow at the Health Foundation: "The sheer number of different routes to urgent care can be confusing, especially when people are scared, or in pain. The public needs more help to understand where to go to get the right treatment at the right time." Should minor injury units open all night? Experts are dubious about a one-size-fits-all approach to opening times. Nigel Edwards, chief executive of the Nuffield Trust, said: "It will often make good sense for minor injuries units not to open all night, as the number of people with everyday injuries is much lower at night. A good solution can be to join services up with out of hours GPs, to ensure that there is always somebody available to help. "Given the current shortages of funding and key staff, it is proving very difficult to keep providing safe A&E services on all our current sites. "Minor injuries units can look after many of the people who would attend a major A&E but they are not a substitute for them in terms of the range of services they can provide." NHS England said there were 23 million attendances at A&E in 2016-17, up 1.2 million on three years earlier. It plans to give more people who call 111 a clinical assessment, reducing the number of people advised to go to A&E or call an ambulance. And by 2019, the service is due to be able to book people into urgent face to face appointments. It also says evening and weekend GP appointments will be available to everyone by March 2019. New urgent treatment centres are being rolled out to be open 12 hours a day, seven days a week.